DaVinci Shake as Siding – Cedar Shake Alternative for Siding! The problems that occur with using a natural wood shake roof also tend to occur when you use natural shake as a siding material. Such problems include freeze/thaw cycle issues that cause cracking and splitting, insects getting into the shingles, etc. So, it comes as no surprise that we have received inquiries about using our cedar shake alternative roofing shingles as siding. Our simulated shake roofing was recently used on a project in South Dakota. And, of course, since the product is a roofing product and comes with a roofing installation guide, there are a few tricks that you need to know. For example, the contractor on the South Dakota project pointed out, "We started with a commercial-grade Tyvek underlayment, then put on the Valoré Shakes. Making the metal trim finishing pieces was the most challenging part of the entire installation. This is a really unique application that any contractor can do to make a home exterior more unique." 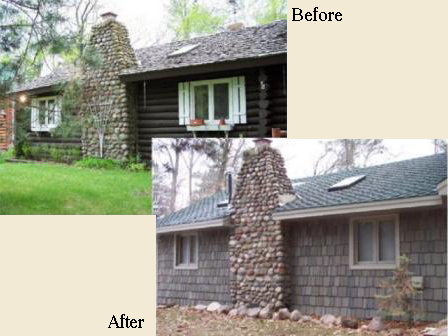 Have you used DaVinci Shake as a siding product on your home or business? How did it turn out? We would love it if you would consider submitting your story.